Two buildings of condo units and a strategic piece of open space that connects the homes to Four O’clock Run make up the Antlers Lodge condos for sale. Ski home via Four O’clock and head across the street to the Snowflake Lift to start the day. These condos, called Antlers Lodge, were built in 1995, making them relative newcomers to this neighborhood, which is only a block or so up Four O’clock Road from the heart of Breckenridge, the performing arts center and the central plaza. Their appearance is modest horizontal siding with a stone-faced foundation. If you’re looking at Antlers Lodge Condos for sale there are a variety of floorplans and sizes, although that itsn’t apparent from a quick look at the outside. They are a condo style with no internally accessed garage and no individual basement, but a half dozen of the units do have an assigned garage space. There are sliding doors onto small balconies on both the living room and bedroom side of several units. 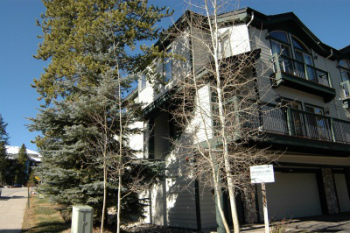 Check out the available units in the Antlers Lodge condominium listings below, or read more about living in this Breckenridge condo. 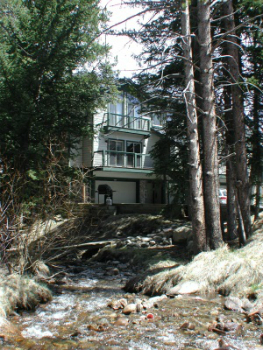 There are a variety of recreational opportunities near Antlers Lodge condos. Four O’clock is a trail that has been preserved between the ski mountain and downtown Breckenridge although many condos have been built on this, the skihill side of town. It’s a gentle run that is more a way to get somewhere rather than a thrill ride, and so it’s has most often been used as a way home at the end of the day – 4 o’clock – when the lifts shut down. Size: 630 to 1712 sq. ft. Amenities: ski in, and ski out via Snowflake, potential covered parking, hot water heat. Drive one-half mile up (west) 4 O’clock Road past Primrose Path, which goes off to the left. Soon after this road, Antlers Lodge will be on the right and the driveway will be between buildings A and B. Be sure to contact Breckenridge Associates for all of your Summit County real estate needs.